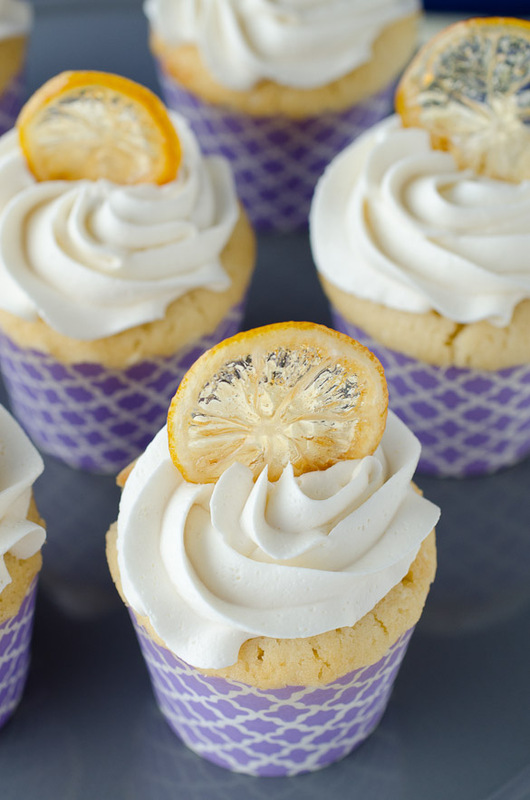 These zesty lemon cupcakes are topped with fluffy vanilla cream frosting and a crispy candied lemon peel. 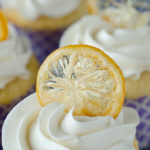 Plus 35 more lemon recipes below! 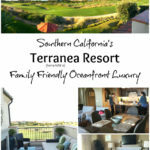 We are celebrating one my favorite bloggers in the world today. Liz from The Lemon Bowl is expecting her second baby boy very very soon and I couldn’t be happier for her!! A few of her blogging friends got together to throw her a surprise virtual baby shower. 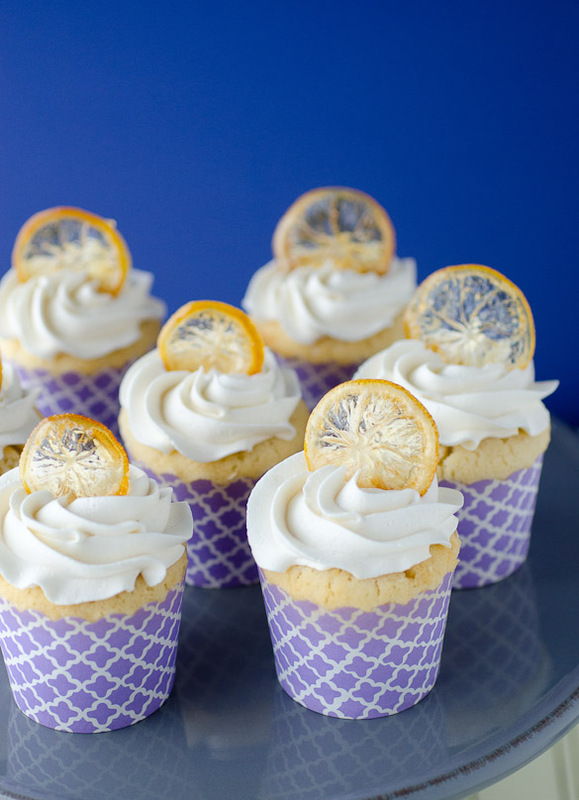 Each blogger had to create a recipe with lemon in it, hence the Lemon Cupcakes with Candied Lemon Chips. Liz and I have a long-standing inside joke where we say “CHIPS!” to each other randomly in social media (Twitter, Instagram, Facebook). 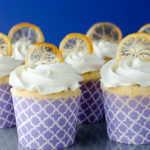 So, naturally, I needed to incorporate chips into my post somehow, which is why I came up with candied lemon chips to garnish these cupcakes. 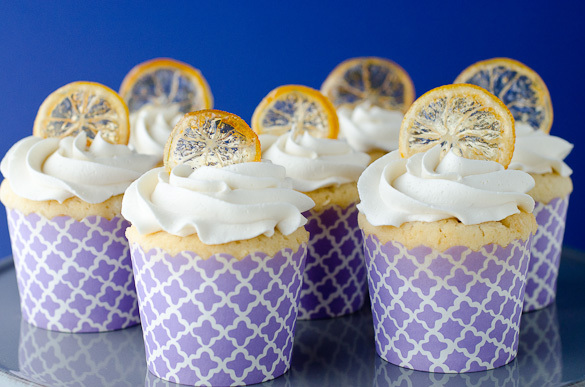 Zesty lemon cupcakes, topped with fluffy vanilla cream frosting. Preheat oven to 350 degrees F. Prepare a 12-count muffin tin with paper liners; set aside. In large mixing bowl, cream together the butter and sugar on medium speed until light and creamy, about 2 to 3 minutes. Stir in the eggs and vanilla until fully combined. In a separate medium sized bowl, whisk together the flour, baking powder and salt. Add half of the dry ingredients to the wet ingredients, and beat until just combined. Add the rest of the dry ingredients and beat again until just combined. Stir in the milk, lemon zest and lemon juice. Be careful not to overmix. Evenly distribute the batter into the cupcake liners, filling about three-quarters full. Bake for 20 minutes, or until a toothpick inserted into the center comes out clean. Remove from oven and cool completely before frosting. In a large mixing bowl, cream the butter on medium speed until light and fluffy, about 3 to 4 minutes. One cup at a time, slowly add 3 cups of the powdered sugar, mixing in the heavy cream between each cup added. Beat in the vanilla extract and salt, then increase the mixer to high speed and beat for 3 more minutes. Add more powdered sugar to reach desired consistency. 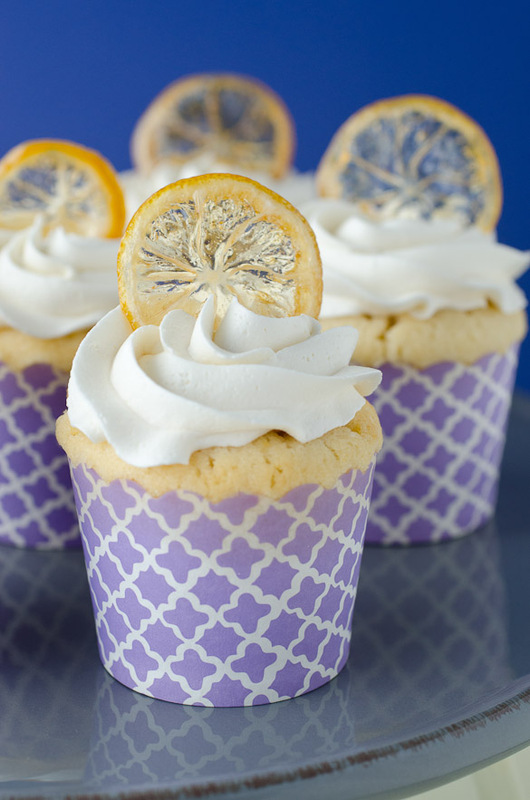 Frost the cooled cupcakes, then garnish with Candied Lemon Chips (recipe below). 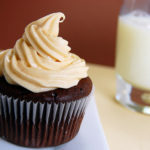 Cupcakes can be stored in the fridge for up to 3 days. Beautiful slices of lemon, candied to garnish your favorite lemon dish. Bring 2 cups of water to a boil in a large deep skillet. Meanwhile, prepare an ice bath by combining cold water and ice in a large bowl; set aside. Place the lemon slices into the boiling water and boil for 1 minute, flipping once halfway. Use a slotted spoon or tongs to remove the lemon slices from the water and place them in the ice bath. Wipe out the skillet with a paper towel and combine 1 cup of water with 1 cup of sugar. Bring to a boil over high heat, stirring until the sugar is dissolved. Transfer the lemon slices to the pan of sugar water in one layer. Turn down the heat and simmer for 1 hour. Remove the lemon slices from the pan and transfer to a silicone lined baking sheet to cool and dry. They will be sticky. Use to garnish over Lemon Cupcakes or for decorating any lemon dish. Check out the rest of the contributors to Liz’s shower. It’s a great menu! Hello, beautiful! These cupcakes are kemonlicious stunners!!! Wow! Those lemon chips are amazing! 😀 What a show stopper. It was a pleasure bringing dessert with you to the shower, Nikki! Now I want lemon “chips” for breakfast! These are no kidding, absolutely gorgeous! I’m know Liz will love these! These are PERFECT, Nikki! And soooo pretty! These are BEYOND adorable!! 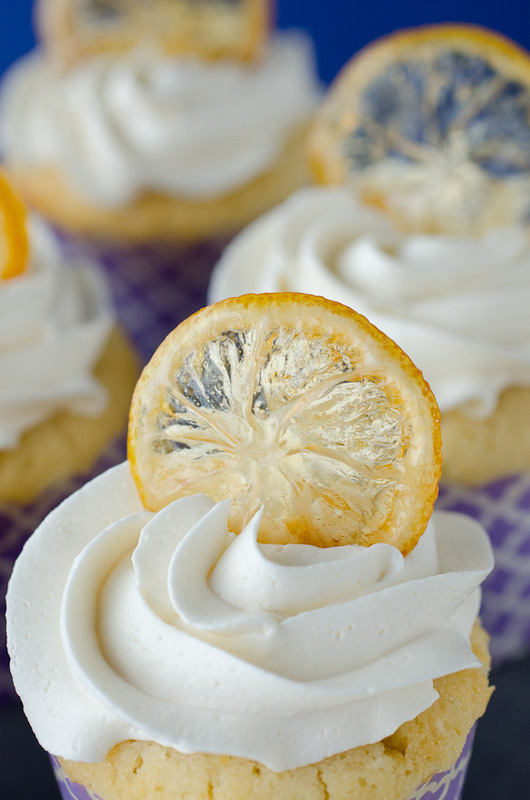 What a genius was to incorporate lemon… I must make them! Great job! Umm lemon chips — need I say more! I want a whole bag of just those. OMG! Nikki, these are freaking adorable!! What a thoughtful thing to make, with the chips and all. 😀 And those chips look SO neat! I’ve never heard of them. The lemon-themed shower you guys threw for Liz was so cute! 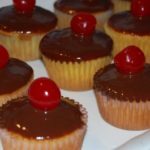 🙂 Your cupcakes look delicious – I love the lemon chips! Nikki, these are gorgeous! I love the candied lemon “chips.” They look like tiny little stained glass windows. What a sweet surprise for Liz! Those lemon chips are gorgeous! Pucker up! These look amazing. Oh my goodness – these are GORGEOUS! Love, love, love them! 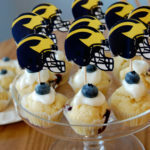 The cupcakes are gorgeous! LOVE the candied lemon chips! Can we eat the lemon chips too? Love them. Thanks! Wow! You’re right! I read it over and over just now and it definitely was missing! Just updated it to fix it. Thank you! Thanks for sharing the lemon chip recipe! I’m wondering how long they keep for/how far in advance can I make them? They’ll be used in the same way. I can’t wait to try them! I wish I could be more help, but I only made these to use immediately so not sure how long they will store. I saw this same recipe on Marthastewart.com and it said that they could be stored for a day or two in an airtight container.